From l.: Jeanine Mason, Demián Bichir, Matías Ponce, Daniel Valdez and Rose Portillo in Zoot Suit at the Taper. Photo by Craig Schwartz. 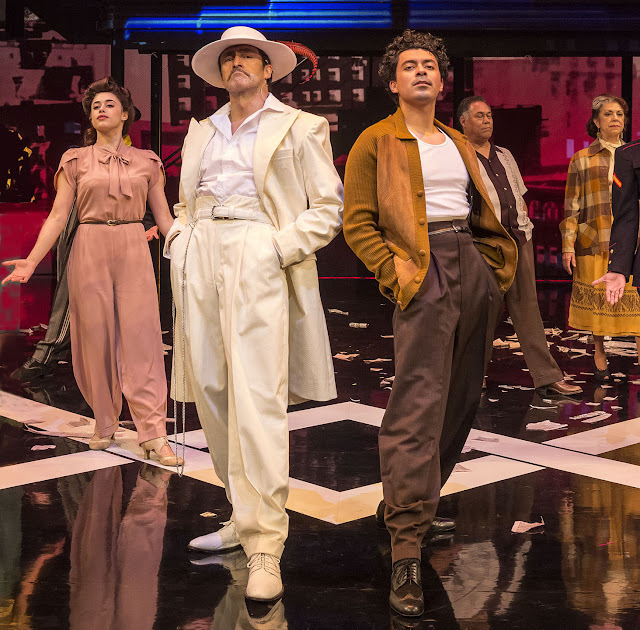 Nearly 40 years after its world premiere at the Mark Taper Forum in Downtown Los Angeles, Zoot Suit has returned to the city that gave it birth under the direction of the show’s original creator Luís Valdez with a bang. The revival production—being staged as part of the Taper’s 50-Year Anniversary celebration, was commissioned in 1977 by the late Gordon Davidson, then Artistic Director of the MTF, after a meeting with Teatro Campesino founder and director Valdez. The play opened in 1978 and began attracting sell-out houses. It ran for months on end before moving to Hollywood’s famed Aquarius Theater and then finally to the renowned Winter Garden Theater in New York where it became the first Chicano theater production to open on Broadway. Valdez went on to produce and direct a feature film adaptation of the play with the original cast which was released in 1982. Among those who were catapulted quickly into fame by the success of the play were actor Edward James Olmos in the role of the iconic “El Pachuco,” and the late but forever unforgettable Lupe Ontiveros, two actors who paved the way for a subsequent generation of Chicana and Chicano films and filmmakers through the sheer strength of their charisma and presence. In the original version, actor and musician Daniel Valdez took on the role of Henry Reyna, a fictional protagonist who is torn between his gang and his family obligations while dealing with the greater issues of war and peace, life and death, racism and discrimination. The story depicted in the play takes places against the backdrop of the little understood Zoot Suit Riots that would follow on the heels of the Sleepy Lagoon trial at the onset of WWII. In the 1942 case against several Mexican American youth who were charged, convicted and sentenced for killing a man without a single piece of evidence linking them to the death, the Los Angeles courtroom where there they were tried became, essentially, a sensational case against the “zoot suit” as an emblem of delinquency and criminal activity. Denied due process by a judge who allowed the prosecution to imply that the clothes they wore, their duck-tail hairstyles and their unique coded–language were enough to put them away because they were descended from “bloodthirsty” Aztecs for whom ritual sacrifice was a genetic or biological predisposition. Sensationalizing the still-to-this-day unsolved death as the work of “zoot suiters,” the prosecution won convictions and inflamed L.A.’s white residents to such a degree of frenzy against the local Mexican American population the Los Angeles. Times adopted similar rhetoric and also began railing against a fashion that was also popular among Blacks and Filipinos as well. The arrival of servicemen from the rural south with no previous exposure to cultural diversity—who looked at the young Latino men in suits that seemed to intentionally defy the war rationing of fabric and textiles—was all it took for the powder keg of racial violence and intolerance to explode. As a result, gangs of servicemen and sailors descended on the city of Los Angeles with a vengeance during shore leave and on weekends, intent on teaching the young Angelenos they looked down on as “hoodlums” and “spics” a thing or two about the consequences of dressing up and strutting about the city with the youthful exuberance common to teenagers of all nationalities. With thousands of Japanese-Americans from throughout the state already removed from their homes by executive order to live in “internment” camps, that period in U.S. history bears an eerie resemblance to the shifts occurring in the country at this particular moment and makes the revival of Zoot Suit even more meaningful. Zoot Suit opened February 12th, and while originally only scheduled to run through March 12th, has been extended through April 2nd due to a high demand for tickets. Written and directed by Luís Valdez, Zoot Suit is presented in association with El Teatro Campesino. The cast includes (in alphabetical order), Brian Abraham, Mariela Arteaga, Demian Bichir, Melinna Bobadilla, Oscar Camacho, Stephani Candelaria, Raul Cardona, Fiona Cheung, Tiffany Dupont, Caleb Foote, Holly Hyman, Kimberlee Kidd, Rocío López, Jeanine Mason, Tom G. McMahon, Andres Ortiz, Michael Naydoe Pinedo, Matias Ponce, Rose Portillo, Gilbert Saldivar, Richard Steinmetz, Evan Strand, Bradford Tatum, Raphael Thomas and Daniel Valdez. Academy Award nominee and international star Demian Bichir (Tarantino’s The Hateful Eight, FX’s The Bridge, Showtime’s Weeds, Soderbergh’s Che and A Better Life) plays the indelible role of “El Pachuco.” Actors Daniel Valdez and Rose Portillo are returning to Zoot Suit after appearing in the world premiere production at the Taper in 1978, as well as at the Aquarius Theatre in Hollywood, on Broadway and in the film. As the original Henry, Daniel Valdez played opposite Portillo, who appeared as Della, his girlfriend. The two are reunited for this new production, with Valdez now playing Enrique Reyna (Henry’s father) and Portillo playing Dolores Reyna (Henry’s mother). Daniel Valdez reprises his role as the production’s musical director once again as well. Jeanine Mason, who plays Della, won season five of So You Think You Can Dance and recently appeared in ABC’s Of Kings and Prophets. She also played a recurring role on ABC Family’s Bunheads. Matías Ponce, who plays Henry Reyna, has appeared in Los Angeles, New York and regional theater productions of such plays as Handball, Short Eyes, Faith: Part I of A Mexican Trilogy and Dominica: The Fat Ugly Ho. His film and television credits include Flight World War II, Lie to Me, Victorious and Rizzoli & Isles, among many others. As he tells it, Bichir is fulfilling a dream by appearing in Zoot Suit. He is taking time off from his busy film schedule to work with Zoot Suit writer/director Luis Valdez. “It’s a tremendous honor to be able to portray such an iconic character of modern American theatre. I grew up dreaming of playing El Pachuco when I was a young member of the National Theatre Company in Mexico City. Having the opportunity to work with Luís represents my biggest challenge in the theatre to date. These times couldn’t be more perfect to present this play to a whole new generation of theatre lovers,” said Bichir. Choreography for Zoot Suit is by Maria Torres, and the production includes songs composed by Lalo Guerrero with guidance from music director Daniel Valdez. Rosalinda Morales, Pauline O’con, CSA, and Candido Cornejo, Jr., CSA pitched in to cast the production, which features scenic design by Christopher Acebo, costume design by Ann Closs-Farley, lighting design by Pablo Santiago, sound design by Philip G. Allen and projection design by David Murakami. The associate director is Kinan Valdez and the production stage manager is David S. Franklin.